It's a nice bracelet. I really like the adjustable snaps so I can make it snug. Display your boldness and confidence with this handsome and unique genuine leather cuff bracelet. 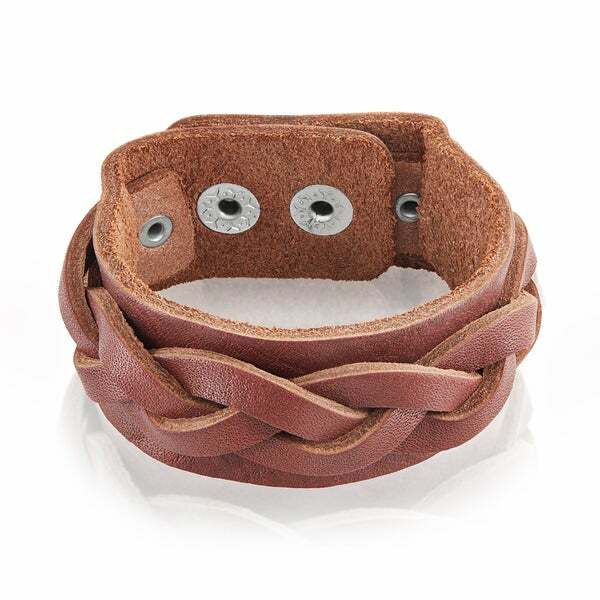 This men's jewelry item features a thick weaved double strap over a 27mm wide leather cuff and it is available in brown, black, and white leather. This bracelet fastens with a snap closure adjustable to 2 sizes. This bracelet measures 7.75 inches long by 27mm wide by 2mm thick and weighs 19.8 grams. Stainless steel is a high strength and high purity metal. Stainless steel will not tarnish, it is stain and rust resistant, and it is also hypoallergenic (unlikely to cause an allergic reaction). Dimensions 7.75 inches long x 27mm wide x 2mm thick.